Although you should base your jewelry purchases mostly on your personal sensibilities, the official monetary value of diamonds (and some other gems) is determined by factors commonly referred to as the “four Cs”: carat, color, clarity, and cut. Understanding these qualities will help you understand how jewelry is created and how industry professionals describe gemstones, and it may help you decide between two equally attractive pieces of jewelry at your Austin jewelry store. Therefore, a diamond considered “fancy intense purple” would have a deeper color than one labeled “fancy purple.” Fancy diamonds are rarer than their white brethren, and in general, the deeper their color, the more valuable they are. 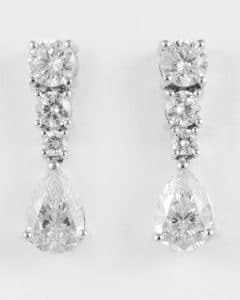 Fancy diamonds are usually cut to emphasize color rather than clarity, and they are often smaller than white diamonds. Diamonds can be treated with heat to change or intensify their colors, but this makes them less valuable than stones with the same color that occurs naturally. In direct contrast to their fancy counterparts, white diamonds are more valuable when they have less color in them. The clearer a diamond is, the better its ability to reflect the colors of the rainbow for us to see. However, since our eyes detect sparkle before they detect color, color is generally considered secondary to cut when it comes to rating white diamonds’ value. However, color still plays an important role, and it can vary widely. These classifications are determined by comparing the diamond in question with a “master” set of diamonds with known ratings under very specific lighting conditions. The differences between one letter and another are extremely subtle and will only be detected by an expert jeweler or gemologist with a high-powered microscope. As a rule, diamonds rated J or better will appear colorless to the naked eye. The setting of a stone will also affect its appearance to the naked eye: a stone that may appear yellowish against white metal will likely look clearer in a yellow-gold setting. The final piece in determining the color of a white diamond is its fluorescence. Not all diamonds exhibit fluorescence, but when they do, it means they appear to change color under different types of light, especially direct sunlight or fluorescent light bulbs. This complicated phenomenon is due to differences in wavelengths of electromagnetic radiation light and can cause diamonds to reflect light of various colors even when the diamond itself is colorless or near colorless. The reflected light is often blue, but it can also appear yellow, orange, or white, and it can even have an oily or milky cast. If a nearly colorless diamond has a yellow fluorescence, it will be less valuable than other nearly colorless diamonds, but if a yellowish diamond fluoresces white or blue, its value will increase. The upshot of this is that it’s very important to view a stone under a variety of lighting conditions before making a purchase from a jewelry store in Austin. When it comes to purchasing a diamond based on color, it’s important to look at ranges. If money is no object, then by all means, seek out fancy vivid colored diamonds or totally colorless white diamonds. But if you’re looking to get a similar impact for a lesser price, consider something in the fancy intense or G to J ranges. Trading down in color quality may allow you to purchase a larger stone. And in the end, you’ll probably be more satisfied with something you just like for a reasonable price, rather than paying a fortune for a stone that appears nearly identical without the use of a microscope. Whatever qualities you’re looking for in your diamonds, the experts at Copeland Jewelers will give you all the information to help you make the most informed choice. At your Austin jewelry store, we love educating our customers about the four Cs!